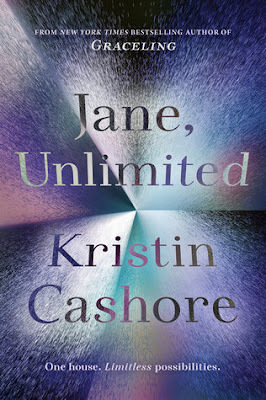 Jane, Unlimited is much anticipated, long awaited new release by Kristin Cashore, and boy was it worth the wait! I read Kristin's first book, Graceling, in the Graceling Realms series many, many years ago, and really enjoyed the book. I haven't had a chance to finish that series, (even though I own all the books), but I was super excited to read something new by her. Jane, Unlimited was definitely an interesting read! This book was full of so many interesting and mysterious characters, including the main character, Jane, who seems to be the most ordinary person in the bunch. It was interesting to follow Jane through the story, and I seriously love her obsession with umbrella making. I like that the secondary characters were peculiar and mysterious, and that I never knew what to expect next from them. The storyline for the book was a little interesting. I didn't really catch on to the format of the book at first, and when I started a new 'section' of the book, I wondered why it seemed to be the same story, just told differently. (I'm not sure if I'm explaining this very well.) Basically this book is like a 'choose your own ending' book. We get the first half of the story in the beginning, then throughout the book, we get 'alternate' endings, and you can basically choose which you like the best. I don't think I've ever read a book like that before, and it was definitely interesting. Reminded me a bit of the movie Clue! Overall; Jane, Unlimited was an interesting and unique read by the super talented Kristin Cashore! It was well worth the wait, and having read the book, I now want to make the time to finally finish Kristin's Graceling Realms series, which I'm hoping that I can get to soon!